A couple of weekends ago, we ushered in fall in upper Vermont and could have continued on to Canada if we’d wanted to, just to say we’d done it…but we didn’t. 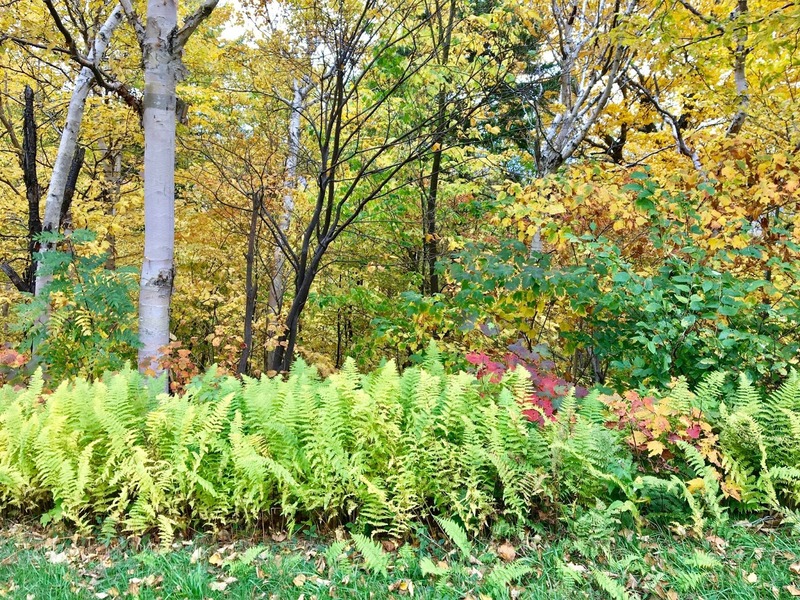 The leaves where we stayed in Warren were pretty much at peak, and the ferns along the mountain trails stood out green and electric against the changing maples. The air smelled like wood smoke at night, and there were ominous frost warnings, but we got a trace of sunburn during the day. Ben will always be a sucker for the mountains of Vermont, since his family once had a farm up there. Five of them—six if you counted the dog—would pile into their wood-sided Wagoneer most Fridays and power up from Westchester; bathroom stops may or may not have been permitted. I would not have wanted to be in that car for anything, based on the fate of his sister's Teddy Ruxpin one particularly fraught trip (I think animatronic toys were banned from the car thereafter). The Sunday night returns were no doubt more subdued, after they’d tired themselves out running or skiing through the mountains, tearing along trails on their four-wheelers, helping their neighbor on his Christmas tree farm. Naturally, since we were in the neighborhood of the old farm, we couldn't not pop in for a visit; it had been over 15 years since Ben had set foot on the soil there. So our family of five drove down the winding roads, along the Mad River for a stretch; past the old garage that he remembered new but which now looked all weathered and decrepit; past Farmer Frank’s ramshackle cabin. All the while we saw hand-painted signs pointing the way to Megan and John’s wedding…which, as fate would have it, was going down right on his family’s former property. I won’t get into too many details, but my children are forever scarred by the experience of crashing a stranger’s nuptials, and were plastered to the floor of the back seat as we rolled up to the upper field—just in time to see Megan, in crinoline and cowboy boots, emerge from the barn on her father’s arm. 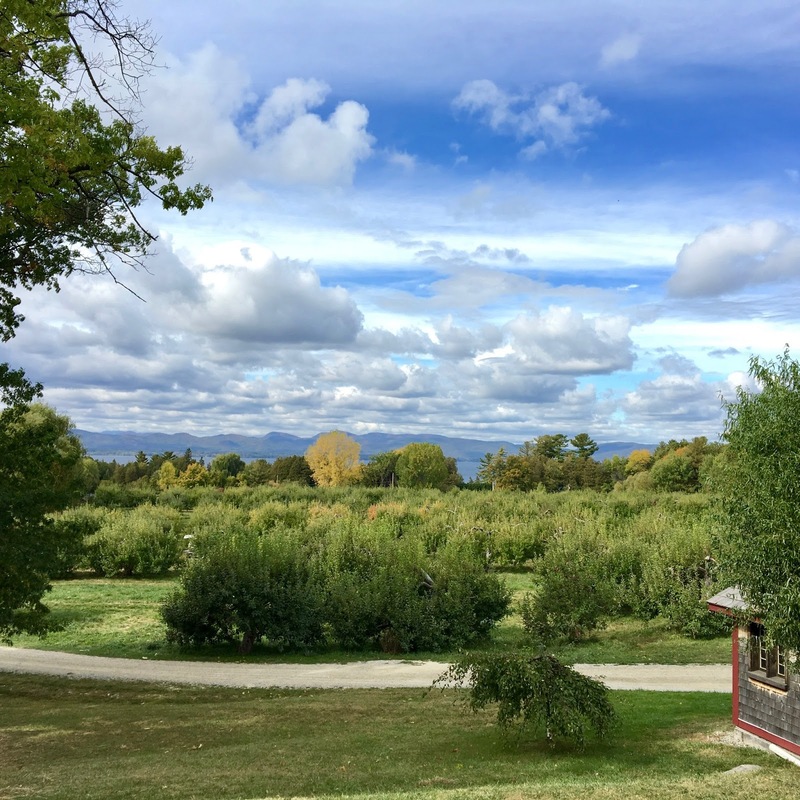 The next day turned colder, a bracing wind sluicing off of Lake Champlain down from Canada, and we went apple picking at the excellent Shelburne Orchards, in view of the lake. We bagged close to 40 pounds of fruit—about the same poundage as the 3 year old—as we shivered in our inadequate fleeces. We’re working our way through it, still. If Mari, our excellent au pair and friend from Germany, were still living with us, we’d have made greater progress by now. There are a lot of things we miss about Mari, and her apple strudel is one of them. Sometimes, on dark winter mornings, we would haul ourselves down to the kitchen to discover she’d baked us a surprise the night before, and suddenly the morning was more of a gift; that’s the kind of person she is. Fortunately, she hand-penned the recipe for me before she left. It comes by way of her friend Andrea, so it got translated from Czech to German and then to English by the time it reached my hands, and it virtually lacked instructions. I’ve had to hit Mari up for crucial details but haven’t had to change much. 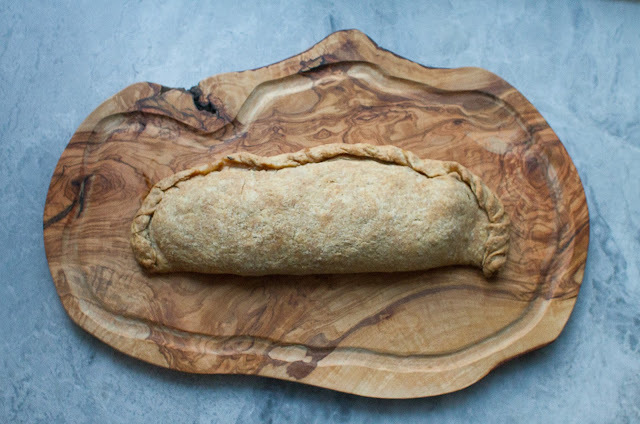 This is not one of your fancy apple strudels, which require lots of rolling and stretching of dough and turn out worthy of a window display in a Viennese bakery. This is one you can throw together with minimal ingredients one night when you have some extra apples and the oven already hot from dinner—and have a wonderful, quick breakfast the next morning. You can even make it with no sugar at all and substitute half whole wheat flour, and it's relatively healthy. This dough is forgiving to the extreme. I have a feeling the quantity of vinegar is somewhat responsible for this; it may seem like a lot, but trust me, this pastry works—it comes out light and flaky but still manages to hold the apples in securely. Sometimes when I make this, it’s a downright hideous, lumpen mass—the Jabba the Hutt of pastries. But somehow, after baking, it all seems to come together and the finished product is lovely in its rustic way. If only the world worked like this pastry does, we could solve a lot of problems. 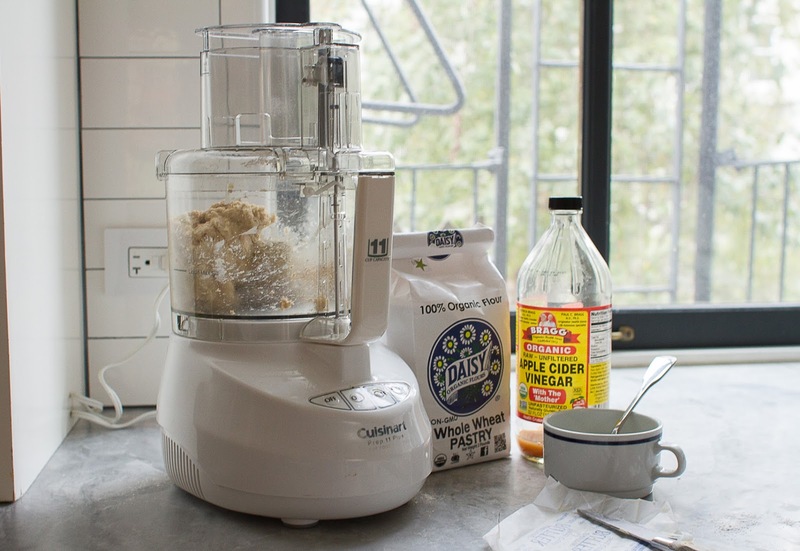 In a food processor or by hand, cut the flour, butter, and salt together until it has a sandy consistency with some larger (lentil-sized) chunks of butter still in. Whisk together egg and apple cider and quickly mix into the flour mixture until it just comes together; if it seems to dry, add a few drops of cold water. Shape into an oblong disk, wrap in plastic wrap, and allow to rest in the refrigerator at least an hour. Preheat oven to 375. Peel apples and grate them, using the coarse holes on a grater, down to the cores (discard cores). Stir in sugar (omit if you prefer) and cinnamon. Before you transfer apple mixture to the dough, you’ll want to squeeze it lightly in your hands to remove excess liquid. On a floured surface roll out the dough into an oblong rectangle/oval shape, using as much flour as it takes to keep the dough from sticking. Dough should be about ¼ inch thick, and rough edges are OK. Carefully move the dough to a parchment- or silpat-lined baking tray. 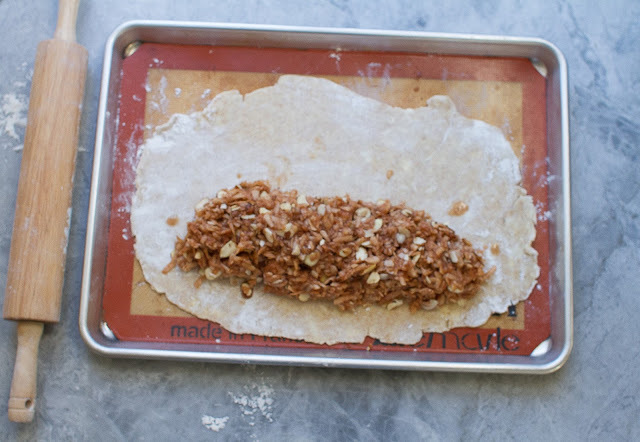 Working lengthwise, line up the apple mixture along one side of the dough, allowing a 1-inch margin. Fold the long side over until the edges meet, and then pinch or twist them together, empanada-style. If any holes spring up, just patch them shut with an extra scrap of dough. Place tray in the center rack of the oven and bake for around 40 minutes, or until the crust is nice and golden. Cool for a few minutes before cutting. Serve with ice cream or whipped cream, or nothing at all.